Should Economists Declare Conflicts of Interest? PAUL JAY, SENIOR EDITOR, TRNN: Welcome to The Real News Network. I’m Paul Jay in Washington. Last week in Denver at the American Economic Association, Gerald Epstein and Jessica Carrick-Hagenbarth presented a letter that proposed that economists should be transparent about their relationships with private institutions–I would guess particularly finance institutions, but not only. The idea here is that many economists, for example, go and testify at congressional committees, give advice on what policy should be, but people watching or perhaps reading don’t know that they may be having been paid or on–having contracts with finance institutions that have an interest in the policy they’re discussing. So Mr. Epstein joins us now from Amherst, Massachusetts, where he’s codirector of the PERI institute and teaches at the university there. Thanks for joining us, Gerald. GERALD EPSTEIN, PROF. ECONOMICS, PERI CODIRECTOR: Thank you very much, Paul. JAY: So why do you think this transparency’s necessary? What problem are you trying to solve? EPSTEIN: Well, the problem I was trying to solve is that, as you know, economists make a lot of pronouncements–and sometimes they’re quite influential–about economic policy, and in particular financial policy, which is what I’ve been mostly concerned with. But sometimes they have hidden material interests, working for companies, being on boards of directors, consultants, or owners, partners in companies that have a direct interest in the outcome of these regulations. And the problem is that oftentimes and particularly academic economists kind of wrap themselves in this robe of scientific objectivity as experts talking about issues of regulation as if they were objective purveyors of truth when in fact they might not be. And this was portrayed very effectively, I think, in the movie Inside Job by Charles Ferguson, where several prominent economists–Glenn Hubbard of Columbia, Frederic Mishkin, and others–were earning a lot of money working for financial companies while at the same time making these pronouncements about financial regulation and not revealing the fact that they had these connections. JAY: So this would be something like a doctor or a scientist recommending pharmaceutical policy while they’re getting paid by pharma companies. EPSTEIN: That’s right, and then not revealing that fact. So I got into this with my graduate student Jessica Carrick-Hagenbarth. About a year ago we decided to look to what extent these potential conflicts exist. So we looked at two groups of financial economists that were making suggestions for financial reform. This was at a time when the Dodd-Frank bill was being discussed intensively. And this was the Pew Trust group and the Squam Lake group of 19 prominent financial economists. And we first looked at whether they had financial ties to companies that we could discover by doing an investigation on the Web and so forth, and we found that 13 out of these 19 academic economists did in fact have these financial ties. And then we looked at their media appearances, their op-ed pieces, as well as their academic articles for about a five year period, 2005-2009, to see how they identified themselves, particularly when they were writing about financial reform. And what we found is that most of the economists never reveal the fact that they had these private financial ties. Only five of the 13 did, and most of them only very sporadically. And we just don’t think this is right, that for people to be able to judge what they’re hearing from these economists, they really need to know what kinds of interests these economists have. JAY: Now, how does this compare to other disciplines, say, sociologists, who also often get called to Congress or other places to testify? EPSTEIN: Well, that’s a good question. An interesting thing is that if you look at the norms within the economics profession, and in particular, say, the–whether there are any rules of conduct by the professional associations, and particularly the American Economics Association, which is the largest, most prestigious, most powerful, economists have no codes of conduct related to this; the American Economics Association does not. On the other hand, the American Sociological Association, the American Psychological Association, and others actually do have codes of conduct which say that their people, sociologists or psychologists, should reveal these kinds of connections. So that’s why Jessica and I wrote a petition or a letter to the president of the American Economics Association, Robert Hall–and we circulated it and got more than 300 signatures from economists–proposing that the American Economics Association institute a code of conduct, perhaps modeled, say, on the American Sociological code. JAY: What happened at the meeting? How could anyone argue against this? EPSTEIN: Well, there was a lot of argument against it. It is funny, though. When this first came out, our study came out, and people started blogging about it and so forth, I did get a email from Larry Summers, who–everybody know who’s–who Larry Summers is. JAY: Well, tell people, just in case they don’t. 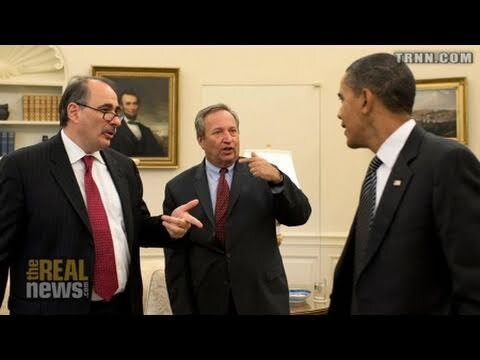 EPSTEIN: He was the former Treasury secretary under Clinton and chief economic advisor under Obama, former president of Harvard University, a very prominent economist at Harvard. And in this email he sent to me, he said, well, you know, he basically agrees with the point that there should be much more transparency. He didn’t think we had treated him properly in our paper, that we didn’t identify the fact that he had revealed some of his connections. And so we readjusted our paper to take that into account. But he seemed to agree with the basic point. But then when I wrote him back and asked him if he would sign this letter, he said no, that he thought the American Economics Association is not the proper organization to be regulating something like this. JAY: Who would be if they’re not? EPSTEIN: Many economists, including he, argue that this should be the responsibility of the press, the press should ask people if they have these connections. And in fact I do agree that the press should be asking that. And it should be the responsibility of universities where these academics work. And I agree that it’d be good if the universities had such codes of ethics. But in fact, if you look at university codes of conduct, almost none of them address this issue. They’re concerned about how much money people get from private interests, they’re concerned about whether getting money from private interests conflict with the goals of the university, but they do not specify, for the most part, whether or not people have to be transparent vis-Ã -vis the public, looking out for the public’s interests. JAY: Now, I mean, it’s almost impossible for an ordinary person to figure this out if they have to when they’re reading or listening to somebody by themselves. EPSTEIN: That’s right. Some economists said that, well, look, you guys found out this information about us, so everybody else can find it out, too. So everybody’s supposed to–every time they hear an economist make a pronouncement about this, they’re supposed to Google that economist, you know, spend an hour or two looking at the economist’s vita, and so forth. And the fact of the matter is we just–I think we’re at the tip of the iceberg. I think there’s a lot of connections that we didn’t discover. So, anyway, at the Economics Association meeting, the executive committee unanimously voted to do a study of this issue and to set up a committee to do this study. JAY: So does that mean they’re serious or they’re trying to bury it? EPSTEIN: Not necessarily. But they won’t reveal the names of the people who are on this committee. I’m not sure why they’re keeping them confidential. JAY: A secret committee to study transparency. EPSTEIN: Exactly. Isn’t that beautiful? There’s the problem right there. So, look, this is no panacea. I mean, even if–. It is true that this is just one small step, but what it would do is create a norm that economists should be following. Then people in the press would feel more empowered to ask economists about this, I think, ’cause the norm would exist. Universities would feel there were models that they could use to develop codes of conduct. JAY: Okay. Just quickly, two more questions. One is, do you have any conflicts that you need to reveal now that I’ve been told I should ask you this? EPSTEIN: That’s right. Well, I have gotten some grants from private foundations, and I’ve gotten–the Ford Foundation and the Institute for New Economic Thinking, which is funded by George Soros. But usually I propose a lot more financial regulation, so I’m not sure that that would be in George Soros’s interests. JAY: And finally, did you find any connection between economists who had received funding and what they said? Is there any–you know, so far, any pattern there? EPSTEIN: The sample that we had was way too small to do a scientific study of this, but we did compare the regulatory proposals of this group of economists as a whole with other groups that I’ve been connected with–SAFER, the Economists’ Committee for Stable, Accountable, Fair and Efficient Financial Reform; Americans for Financial Reform–and we did find very clearly that the kinds of proposals these people were coming up with were much less intrusive, much less strong than the kinds of proposals that we came up with. We can’t prove this is connected to their receiving money. The bigger problem is that there’s this club of economists who consult for private financial firms, who have top jobs in private universities, who testify before Congress, and all of whom basically see the world–many of whom basically see the world through finance-colored glasses. And so they’re not going to propose really strong financial regulations. If you start doing that, you get kicked out of this club. What we need to do is open up the process of economists and open up the system so that more economists who have broader views and more critical views get heard. JAY: Thanks very much for joining us. And I guess it’s good advice: when you’re listening to anyone, you might ask that question and try to follow the money. Thanks for joining us, Gerry.